At QIVC today the sun is shining on the accumulated feet of snow, packing it down and making it harder to shovel where the wind has blown it into the paths. For the last week or two we have been shoveling paths to our houses, then watching them fill in with snow a few hours later--thanks, wind! At the same time--today feels like spring. The birds are singing, the snow-covered eaves are dripping, and the days have gotten noticeably longer. 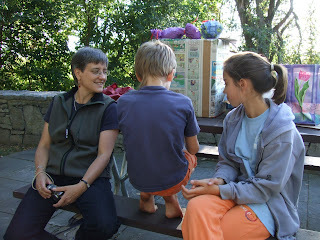 Our family is thinking about lots of projects this coming season. We would like to repair our chicken coop and buy a new flock of meat birds or layer hens (or both! 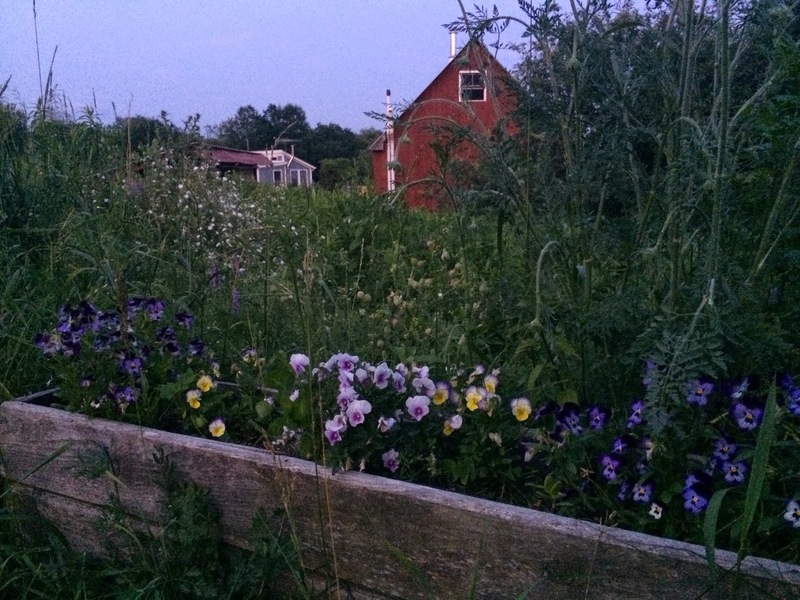 ); we'd like to plant beans, tomatoes, eggplants, peppers, mustard, and okra, and continue learning about what wild foods grow here; there are things to be fixed around the house; and we want to explore the larger community and the region more. 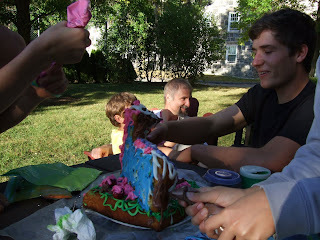 At this time I can't help thinking about the projects that have gone unfinished or undone. This winter we wanted to teach ourselves how to tan sheepskins from last year's flock, but never scraped together the materials or the time to experiment with it. I learned the basic knitting stitch but haven't completed a first project. We didn't manage to split and stack all of next year's wood before it got covered with snow, and many items in our house are still in need of repair. It's a challenge to juggle this kind of life with full-time work and raising a family. But somehow the coming of spring never fails to fill me with optimism, making me think everything that's meant to get done will get done, in the end. 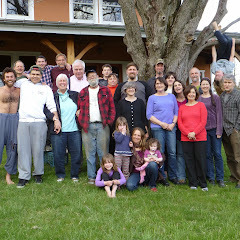 Buy or build a house in our intentional community in East Chatham, NY. Find out more on our web site. Visit our QIV-C Web site! If you're interested in the Quaker Intentional Village Project and our village in Canaan, New York (QIV-C), please come to our Web site for news and up-to-date information about us. It's at qivc.org and is much more timely than this blog. Dee took some great pictures yesterday at our harvest-time Rhythm Day! Click the title of this post to see them. 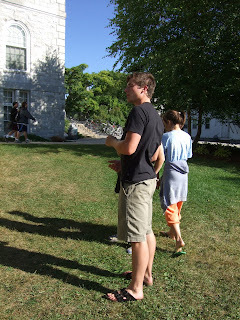 The Beers and Harris-Brauns visited Lucas at Middlebury College on Sunday to celebrate his 19th birthday. We had an easy drive there and a nice tour of campus, and we took Lucas out to dinner before we headed back. We brought a birthday lamb-cake kit! Lucas found us a nice picnic table at which to do the decorating and eating. Hmm, it was kind of out of the way of everything....a private spot. It was a very brightly decorated little lamb in the end. After we lit candles, sang, and ate a piece each, we left Lucas with the rest of the cake, plus plates, napkins, and even a bag to keep it from getting stale, in the unlikely event that there was any left by bedtime. He opened his presents which seemed like good ones, especially the new fleece and the sun light. Before the cake we walked around the campus. (Will unicycled.) 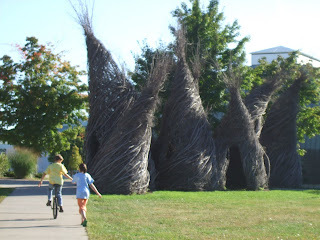 Here are Will and Carolyn going toward the art center with a cool sapling sculpture on the right. 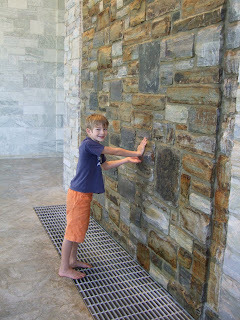 There is a lot of stone at Middlebury. This is a fountain thing in the old library. 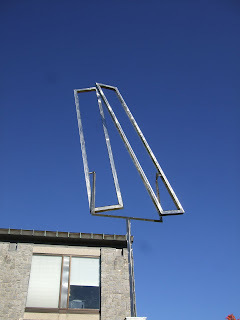 A little touch of home--a kinetic sculpture by George Rickey, made just up Route 9 from QIV-C in New Lebanon, NY. 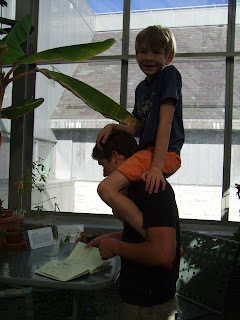 Lucas and Jesse in the Middlebury greenhouse, which is high up in the fancy science building. 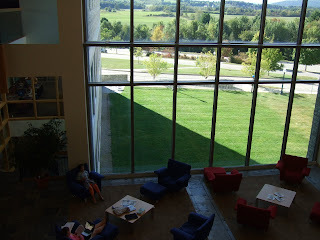 A study area in the science building--but who could study with that view? Carolyn is trying out the college lifestyle in the leftmost easy chair. Eric noticed the opulence and luxury of the campus buildings; Ellen noticed all the stonework including a WHOLE BIG BUILDING faced with her favorite stone, American Granite; Will noticed many unicycling paths; Jesse noticed lots of opportunities for riding on Lucas; Sandy and I noticed that we ran into lots of Lucas's friends, most of whom started last February, as he did; and Carolyn noticed that it was definitely time to go out to dinner. Hello Friends of QIVC. There are some new items to watch here on our blog, as I learn a bit more of how to use this networking resource. Please notice that "My Blog List" has been added on the right-hand side here, if you scroll down a bit. These are Blogs to Watch if ever there were such! First, notice the blog Naissance of Awareness and Thought, by a college-aged member of our community describing her experiences in Burkina Faso, a country in West Africa. Natalie plans to work in a hospital there and hopefully "catch some babies!" 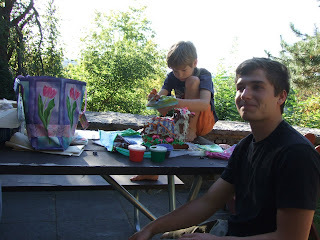 Next are the blogs of a recent and much loved intern at QIVC, Matthew. In his blog learning to live in a world of less you'll find lots of interesting info and links. 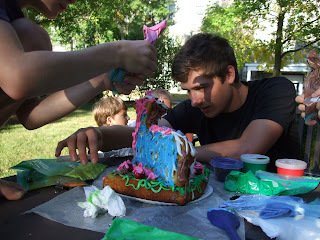 Notice the entry on Saturday, December 27, 2008 which describes some of Matthew's experiences interning with us. I have also included Matthew's bike blender blog in which he will share his experiences "with appropriate technology in rural Guatemala." Day 4 (Wednesday) is drawing to a close and I certainly earned my pay today. We left the hotel at 6:30 a.m. and arrived back at 9:30 p.m. I have many impressions I’d love to share with all of you, but I’m kaput. Okay, okay, here are just a few. It took us 3 hours to reach Phulpur in the Mymensingh District, just 25 kilometers short of the northern border with India. I saw one fascinating thing after the next pass by my car window. The lead auditor, my partner Sol, was getting sicker and sicker as we drove north and by the time we were in the opening meeting with the staff, she was “hanging by a thread,” she told me. At the meeting’s conclusion, she had to go lie down, so I was in charge – after having so successfully programmed myself the previous two days not to take the lead on anything! After lunch, Sol roused herself and went in the car to a sub-office, where she reviewed files and interviewed sponsored children. Tarikul and I went to visit projects traveling by motorcycle. We couldn’t go by car because the narrow, dirt pathways that lead from the main road to villages, threading their way among the rice paddies and fish ponds, only accommodate motorcycles, bicycle rickshaws, and pedestrians. Now, imagine – in order for WV to take me by motorcycle as a passenger, they had to find a woman driver. No way could they have me straddle a seat behind a man! They had to survey all the sub-offices in that part of Bangladesh to find the best two women motorcyclists (preparing to take both Sol and me), confirm they had licenses, and then ask them to come for the day. Indeed, my driver (a Project Officer, not a chauffeur) was excellent and all went smoothly as we made one short trip after the next from project site to site. By the end I was quite good at putting on and taking off my helmet, staying relatively modestly covered, and keeping my long scarf out of the motorcycle wheels. Some day I’ll tell you about my challenge with scarves, if you’re interested. The projects were interesting (adolescent reproductive health, student tutoring, crop diversification, etc.) and the children and adults generally enthusiastic. Tarikul did a great job at each stop when we interviewed the groups. He would take my initial questions and carry on a good exchange with them, acquiring just the type of information of interest to Sol and me, as he had learned the previous day. I could write a few pages on the harrowing 4-hour ride back to Dhaka, but maybe it’s best left undescribed. Bottom line is, our driver didn’t hit or kill any of the thousands of people on the road, many of whom were emerging after 10-hour shifts in the huge garment factories we passed by. Whew. Tomorrow we finish our review, prepare our findings, and debrief the Dhaka team. I head to the airport then for an evening flight. See you back in the U.S. soon! On Day 3 (Tuesday), we went to the northwestern part of Dhaka to see programs for children and their families. It’s always a lot of fun to witness the hope and the empowerment of the beneficiaries and the commitment and energy of the staff and volunteers who are helping to make it happen. “My daughter is in 11th grade,” said one mother who probably only completed 4th or 5th grade herself. “After she graduates from high school, my daughter hopes to go on to college. She is so confident and capable that I am sure she will always be able to fend for herself in the world,” she said with a big smile. All this education for a girl was made possible by WV providing encouragement as well as support for school fees, uniforms, and basic school supplies each year. Imagine what the parents think: Can I afford to send my girl to school? What will it cost in cash outlay? What will it cost in foregone income – money she might make if she weren’t studying? This raises the question, what does it take to tip the balance to education over child labor? Not much during the first few years of a kid’s life, but more and more as the child becomes older. Sorry, sorry, I’m sounding like a fundraising letter. I just wanted to share with you how inspiring my days can be. On the less inspirational side, in between visiting programs we reviewed documents – invoices, receipts, letters to sponsors, child progress reports, program plans, project evaluations, and more. We learned more about three different computer systems used for sponsorship management, program monitoring and evaluation, and financial tracking and reporting. We drank coke and tea and accepted flowers and presents that on Thursday we will give over to the staff in the main office. Although we had told the director that as auditors we are not allowed to accept gifts, cultural norms get in the way. Tomorrow we’ll be visiting programs in a distant rural area. Will we ride on boats, motorcycles, or bicycle rickshaws? We’ll see!